Google’s blog publishing service, Blogger, is a popular content management system for casual bloggers, but it doesn’t provide nearly as many features and the degree of versatility that a self-hosted WordPress site does. Powering almost a quarter of all websites, self-hosted WordPress blogs come with a vast database of themes and plugins as well as the ability to make more advanced changes to the inner workings of your site. If you have decided that it’s time to make the move from Blogger to WordPress, you will first need to register a domain and install WordPress. Then you can use the one-click import option in the WordPress platform to transfer all of your posts and reader comments with ease. In this guide, we’ll take a look at how to use the feature and transfer your content over in a matter of minutes. The first step involves copying over all of your content, including your images and links, from your Blogger website into your new self-hosted WordPress site. 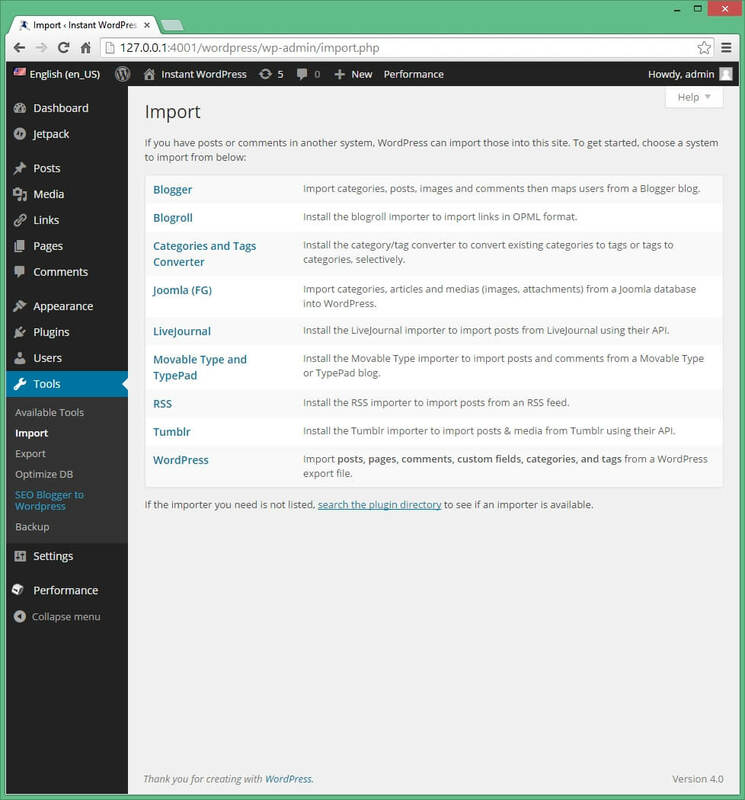 Navigate to “Tools > Import” in the administrator dashboard of your self-hosted WordPress blog. Click “Blogger” in the list of options, and click “Install Now” in the bottom-right corner of the pop-up window. Click “Activate Plugin and Run Importer” once the plugin has been downloaded and installed. Click “Authorize” to give WordPress permission to access your Blogger website. You will be transferred to your Google account. Click “Allow access,” and you will be taken to a new page where you can access and manage your Blogger posts, comments, links and images. Click “Set Authors” once the content has been imported from Blogger, and assign your author name to the imported posts. To help maintain any search engine optimization work you did on your Blogger website, you should change your permalink setup so that it matches as closely as possible to that of your old website. Navigate to “Settings > Permalinks” in your WordPress site to view a list of options for your permalinks structure. Choose “Month and name” from the list of options, since this most closely matches the structure used on a Blogger website. One of the most important steps is to set up a redirect so that visitors to your Blogger website will be automatically redirected to your WordPress blog. The easiest way to set up a 301 redirect is to use a plugin, such as “SEO Blogger to WordPress “. Navigate to the “Plugins > Add New” page in your WordPress administrator dashboard, and search for the plugin referred to above. Click “Install Now,” confirm the installation, and click “Activate Plugin” once the process is complete. 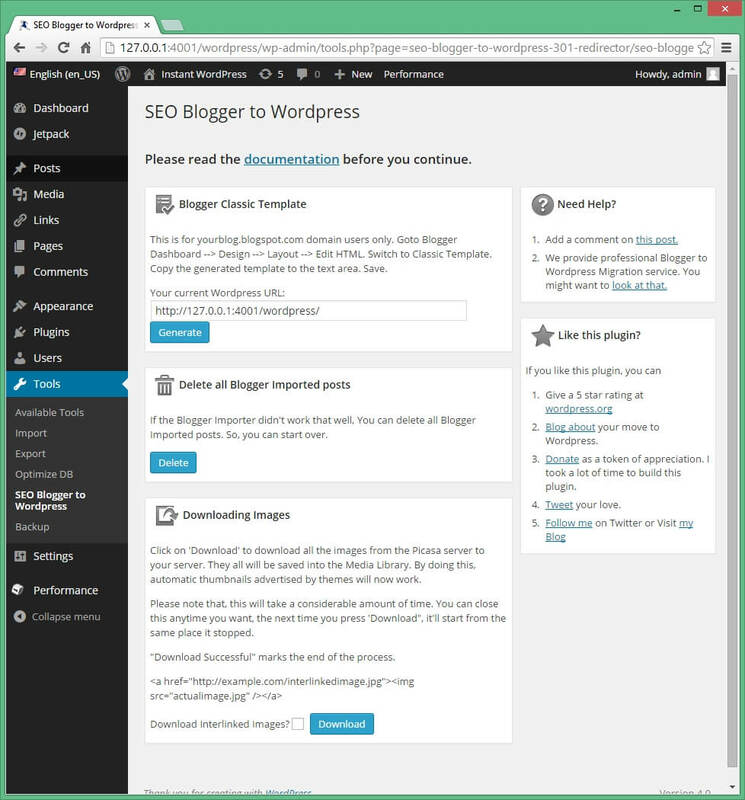 Navigate to “Tools > SEO Blogger to WordPress,” and click “Generate” to create a template for copying to your Blogger website. Navigate to “Design > Layout > Edit HTML” in your Blogger dashboard, and switch to the Classic Template.